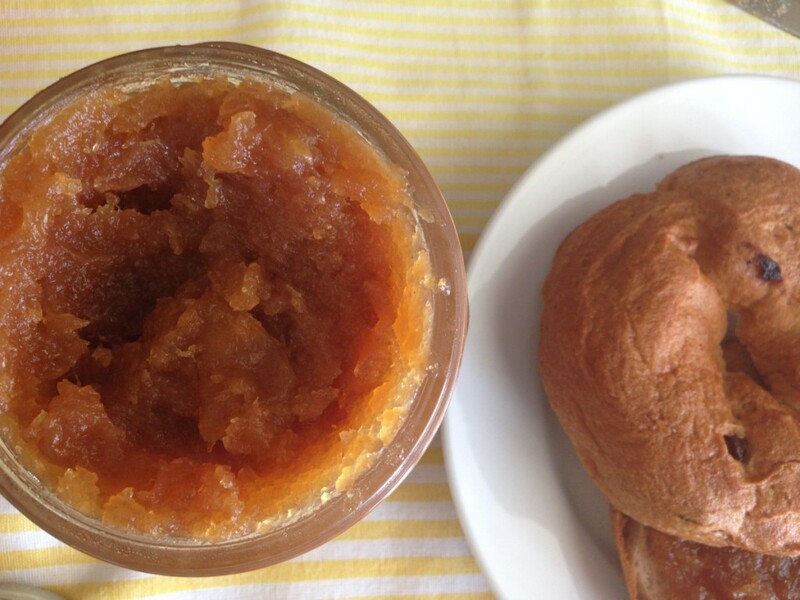 This apple butter will have you standing at the counter eating right out of the jar. That’s exactly what I did — just stood there taking in spoonful after spoonful. My goodness, the tartness from the granny smith and honey crisp apples had me drooling. Eventually, I did get some on my raisin bagel. A warm, toasted bagel with coconut butter and apple butter, that is. And did I mention the buttery texture — so creamy. Don’t get me wrong, there is plenty of sweetness in here, but the tartness from the granny smith apples in here are the clincher. 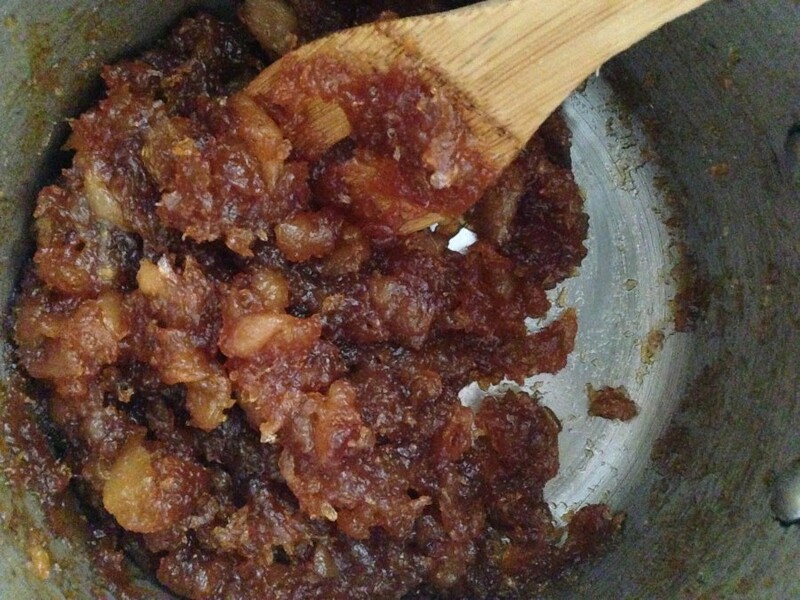 Homemade Apple butter. On everything. Is a very good thing. Peel, core, and dice apples into 2-inch chunks. Put apples into a heavy bottomed medium saucepan. Add the remaining ingredients. Turn heat on to a medium-high heat, bring to a boil. Cook for about 30 to 35 minutes. 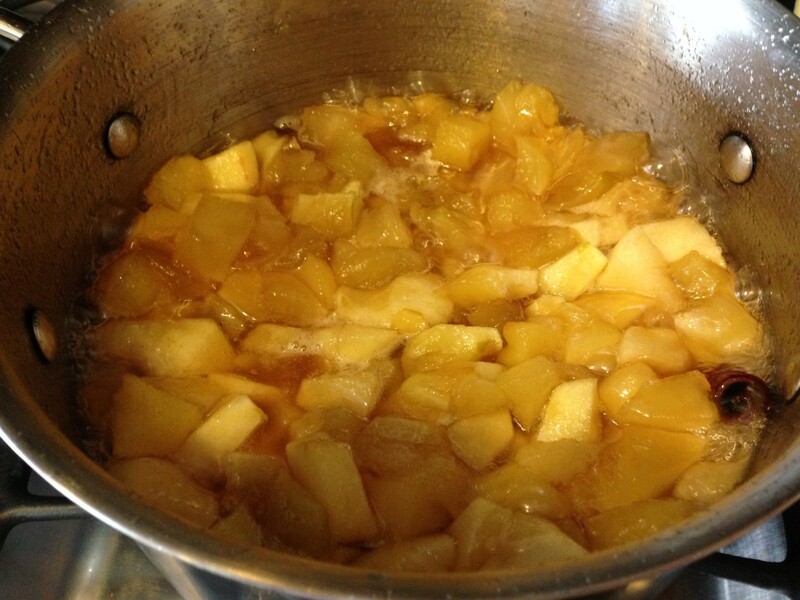 Do not stir the mixture until the liquid has evaporated and the sugar has turned into a brown film on the apples, and caramelizing on the bottom of the saucepan. It will look like it has nearly burned. Now turn the heat to low, stir, and turn over the apples a few times. 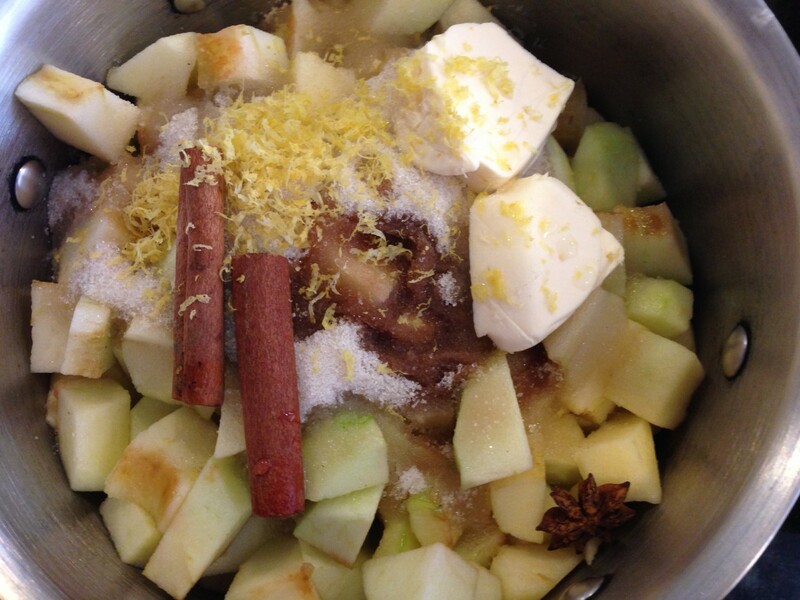 This will create new crust, or caramelization on the apples for added flavor. When you see it is beginning to brown again, stir the mixture. It should now be a sauce consistency. Break up apple chunks with a wooden spoon. Stir again. Continue to cook another 20-25 minutes. It is ready when it becomes a thick, jam consistency. Remove cinnamon sticks and optional whole clove. Let it cool until warm to the touch. Puree until smooth, using an immersion blender or food processor. Transfer to a glass container. Refrigerate for up to a month. Note: To make it an applesauce, just cook 15-20 minutes less time before the second stage of caramelization begins and the apples have broken down. What is that in the first prep picture? It looks like butter. This has so much sugar, can I substitute with stevia sugar? Or leave it out? I haven't tried that, but don't see why not. It may impart an aftertaste from the stevia. 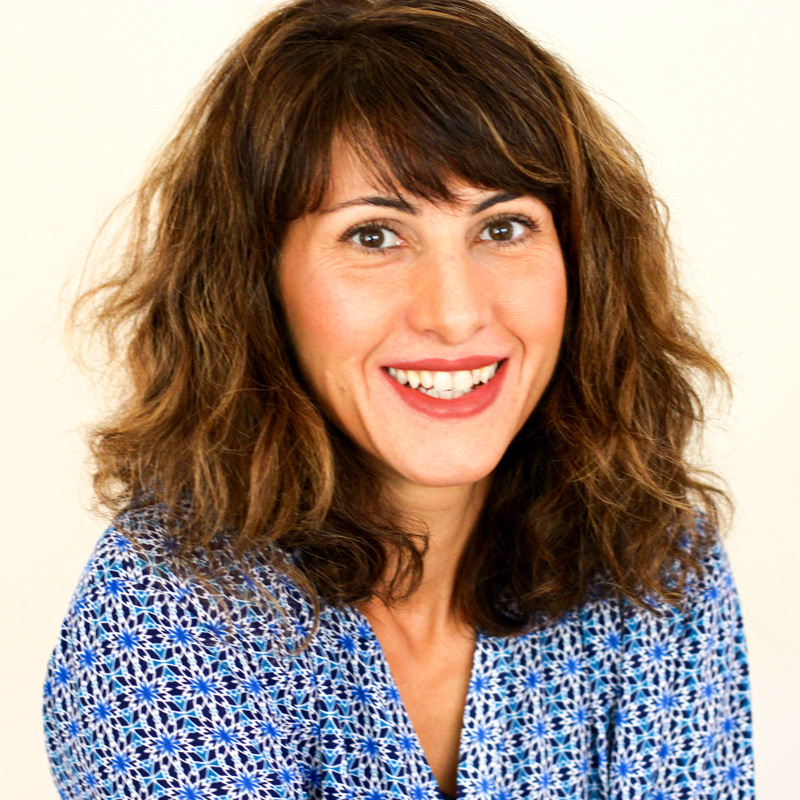 Coconut sugar has a lower glycemic index, you may want to try that. Let me know how it comes out. yes this looks easy but so fancy! I know what I'm making today. Yum. I made the apple butter today and used my immersion blender to smoothen it. It made a big difference in texture. I got the tang you mention and am so pleased with how it turned out. I'm going to put it my pork tenderloin and serve for dinner tonight! Glad you loved it! So hard to stay away from this stuff! I'm so glad you have pictures to show the cooking process. I thought I ruined it but saw it looks like yours so I didn't give up and it came out delicious. My first attempt! Thank you for your detailed recipe. My apple butter came out tasty as ever. Yum! 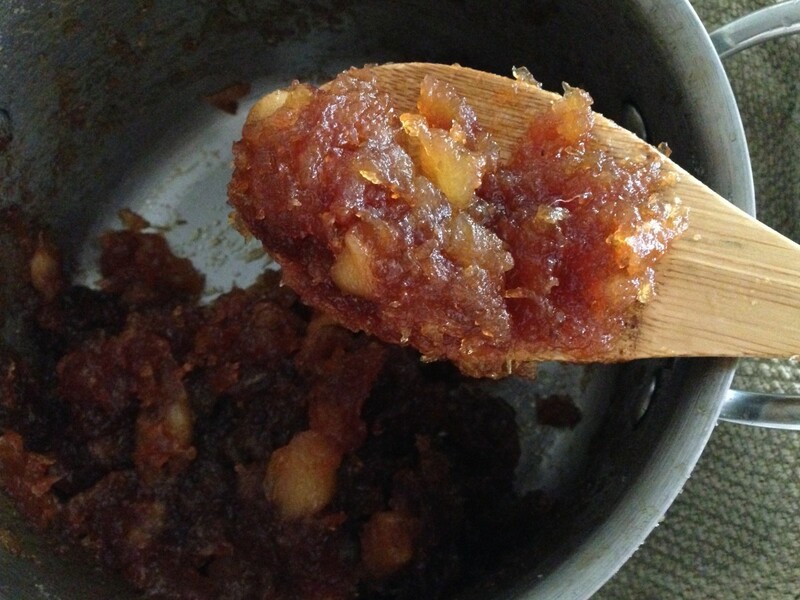 I have made apple butter before but it usually came out runny. I like that yours can spread on bread. I only needed an additional 15 minutes after the first stage. Good thing for your photos that I turned it off when it looked like yours. Made this super amazing apple butter today! Thanks for your picture tutorial it took the guesswork out, it's so good in my oatmeal!! This makes such a nice gift! I put the apple butter into mason jars and gave them away with some muffins I baked in little baskets for my gluten free vegan friends. Thanks for this! This came out incredible! I used pink lady, and granny smith, it cooked down and browned after 20 minutes (my heat may have been too long) and took your cue via photo to turn off heat. The flavor is like no other and am loving this with my daiya cream cheese on a bagel. Thanks for a great recipe!